Posted on Tue, Dec 15, 2009 : 10:32 a.m.
Jolly Pumpkin vice president of sales Mike Turriff and auctioneer Wayne Reif introduce a rare beer to bidders. "We always had a bottle or two left over after we packed up the cases for wholesale," began Ron Jeffries. "We knew someday we would know what to do with the leftover bottles, and someday is today." 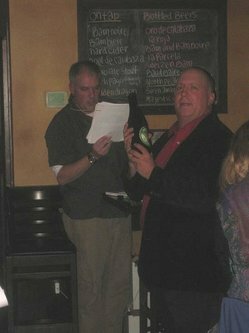 Jeffries, the owner-brewer of Jolly Pumpkin Cafe and Brewery, 311 S. Main, kicked off last night's rare beer auction for charity with reminiscences about the start of his brewing business 6 years ago. From a small space in Dexter, his business has now grown to include the Dexter brewery as well as a pub on Main St. in Ann Arbor and another on the Old Mission Peninsula in northern Michigan. His beers have been nationally ranked by the likes of Men's Journal, Wine Enthusiast, and Paste magazine. So, naturally, the chance to grab some of Ron Jeffries's rare brews that have been cellared, stored, or otherwise forgotten the past 3 to 6 years appealed to a number of people. Auctioneer Wayne Reif donated his time to help the cause. "I'm a former auctioneer now because of this thing called eBay," he told the crowd. "Now I do free and charity auctions like this." All told, Reif, Jeffries, and the rest of the Jolly Pumpkin crew raised $2020 for the local charity Peace Neighborhood Center, with various bottles of aged beer going for anywhere from $30 to $45 apiece and more. Ron Jeffries introduced this event as the "first annual," so if you missed out, one can only assume that there's always next year! David Bardallis is a freelance writer and editor, blogger, bon vivant, and man about town. Visit his Web site, DavidBardallis.com, to engage his services or read his latest. Email your beer-related thoughts to annarborbeer@gmail.com. Wed, Dec 16, 2009 : 4:21 p.m. Wed, Dec 16, 2009 : 4:18 p.m. I was at the Pumpkin on Monday night, but my visit was for the new Maracaibo Especial. I *loved* it. Wed, Dec 16, 2009 : 3:18 p.m.
We went to the Jolly Pumpkin on Main the other day for the first time and were ecstatic! Only had time to try 3 different brews.. but will definitely be back soon!